Stocks Stealth Bull Market Riding Tsunami's of Debt Crisis Fears to New Highs, What's Next? Greece exiting the euro-zone will result in an very high inflationary event for Greece (at least an 30% annualised inflation rate) which follows on from a 4 year inflationary depression that has seen year on year rising prices whilst the Greek economy has experienced severe economic contraction as a consequence of rampant ECB money printing to finance the Greek budget deficit rather than to face the music that Greece has been bankrupt for at least the past 2 years. The rest of the eurozone and wider world watch on in fear of what will follow an inevitable Greek exit as attention will then turn to the Next Euro-zone member to be thrown out as the whole of the Euro-zone risks being consumed by a series of ever expanding debt crisis black holes that I touched upon several times during 2011. Meanwhile, despite ALL of the mainstream news and widespread doom is imminent commentary, the stock market Spartan warrior style has marched relentlessly higher to a series of new bull market closing highs (DJIA) which illustrates like nothing else that most of what you read in the mainstream financial press and non mainstream internet that I term as the BlogosFear is pretty much WORTHLESS. When one reads arguments that are so forcefully presented, they do appear ever so convincing but only one problem, they NEVER MATCH the reality of what actually transpires in the REAL WORLD. Instead at least 90% of what is written is DETACHED from reality, therefore it amounts to nothing more than pure propaganda, most of which in the final analysis is delusional. It does not take much research to go back and see how virtually every down day during the past 6 months was supposed to have marked the start of the GREAT BEAR MARKET or worse, and that many of these so called experts have been foolishly wrong for nearly the WHOLE of PAST THREE YEARS! which is how long this stealth bull market in stocks has now ran. "know the stock market is finished." .... That was the message blasted loud and clear right across the the mainstream press viral style when the Dow and the FTSE were about 20% LOWER. What about the voices of reason that the general population looks towards for answers such as the BBC's Robert Peston in the UK on why the stock market is rising? "The behaviour of the markets seems to be slightly odd, because markets have stabilised and share prices have risen a bit, and its quite difficult to see why that would be, plainly investors are taking comfort from the noises out of athens that this referendum may be off and may not happen. but lets be clear that the spectacle of these frantic negotiations is not exactly evident of a stable government, is altogether plausible that this government will fall, and in a general election where Greece will stick with the bailout plan is all up in the air". "I find it slightly peculiar why investors are seeing this as good news"
And that was when the market was a good 10% LOWER, its no wonder this stealth bull market in stocks has passed the vast majority by as they remain FEARFUL. In fact I have seen this many times before that when the mainstream turns bullish, and the perma-bears start throwing in their towels is JUST before the market enters a bear market. I have seen it many times, in many markets which is why most are perpetually wrong BOTH UP AND DOWN. When the ONLY mechanism they need, the ONLY Voice they need to listen to is their own trading account for if they had acted on the utterances from the perma-crowd and the mainstream press then they would have LOST MONEY and that would tell them the truth about what is actually going on. FEAR SELLS, Which is why most of what you read and gravitate towards is fear related and nothing illustrates this more than what I term as the BlogosFear, it is a case of the perpetual crash is coming mantra, which is just the latest manifestation of the age old end of the world prophecies that for some reason the human psyche seems to be fixated upon, perhaps its coded into our genes and is related to our need to be scared into following societies rules which up until quite recently were determined wholly by religious dogma. The fear of what will happen to you AFTER you die if you do not obey your masters. Fear we take notice of and react towards, and focus on, so it is not so surprising that most of the news and commentary is fear related because it is what we seek out to be scared, be it in real life or in movies or in markets. Fear of recession, depression, economic collapse, financial collapse, war, the end of the world ! Originally, when the stealth bull market in stocks began in March 2009 (Stealth Bull Market Follows Stocks Bear Market Bottom at Dow 6,470), I knew that there would be many fear mongering perma-fools out there who would continue to bet against its existence for many, many months, however I never imagined that this delusional state would still exist near three years on! This is despite the fact that if they had followed their own advice then they would have already bankrupted themselves several times over, still the same overwhelming delusional commentary persists the reason for which I have touched on many times over the past few years but basically it comes down to this, that at least 90% and perhaps as high as 99% of what is written is by those that do not trade or invest, instead it is written by salesmen of one type or another be it a CEO selling his company on CNBC or a an academic selling his theory or a failed trader selling his latest book or service. In my 25 year+ trading and investing experience, the ONLY mechanism for generating accurate investing and trade scenarios. Whilst many people obsesses over forecasts all we can do is to focus on what is likely to be the most probable scenario against which to measure market price strength or weakness and then REACT accordingly, and the only mechanism that can allow investors and traders to achieve this, to know when one is right or wrong in their scenario / open positions is ones trading account. For if ones scenario is right then one accumulates profits, if one is wrong then one accumulates losses, it's as simple as that and all there in black and white, so one cannot delude oneself that one is right when one is actually wrong as many of these perma-fools have been doing during these past 3 years. You have to realise that delusions are widespread, everywhere I look I see self delusion, people get themselves into a state of mind on a particular market or trend and then for some season remain perpetually fixated on it. They appear to lack a mechanism to tell them when they are wrong. This explains why academic economics are wrong at least 90% of the time and why journalists are always giving you advice based on looking in the rear view mirror long after the time to act has passed because they have no correcting mechanism to tell them when they are right and when they are wrong. The reality is much worse than that because journalists and economists are PAID to follow a school of thought so there is never any real PAIN associated with being wrong instead readers are treated as amnesia suffering naive fools that will continue to buy FEAR filled trash regardless because as we all know FEAR SELLS. In economists we see this in the non existant deflation mantra against the reality of an on going Inflation Mega-trend (ebook free download) that has never matched the deflation mantra which amounts to nothing more than economic propaganda that your government wants you to swallow so that it can keep printing money (in all its form) and debasing the currency, which it has to do because that is how it bribes you at election time. This is the primary purpose of Central banks, which is to obey their political masters by ensuring that Governments are able to print money (debt) to buy votes, no matter which party is in power which as most American's should be realising at this precise moment in time because there is very little difference between Red and Blue, Bush and Obama, they are just different shades of colour, the politicians are ALL the SAME. NO politician can get elected unless they are PART OF THE SYSTEM which has its whole basis in the elite getting FIRST CALL ON INFLATION. Economics as far as the mainstream press is concerned is pure propaganda and nothing more, it has nothing to to do with the real economy, that is not what the politicians want your to read or hear about. Economic statistics in most part exists purely to massage the populations expectations to get them to work for pieces of paper (fiat currency) that is perpetually being devalued by means of money printing. The powers that be attempt to keep the flood of money at a rate that does not result in the collapse of confidence in fiat currency which is why you have been brainwashed to accept that Inflation is good and deflation as bad when the truth is the exact opposite ! Inflation of even 2-3% ensures that your life time accumulated savings will become worthless by the time you need them which is why you should only ever hold cash in deposit accounts as a temporary measure. For instance in the UK current official CPI inflation is 3.8%, against savings rates of between 2-3%, taking 3% net of 20% tax to yield 2.4%, which means you will lose a least 1.4% of the value of your savings per annum and more so if inflation goes higher as savings interest rates fall, as many banks adopt devious tricks and tactics to cut the rates especially on anniversaries where rates paid can quietly drop to virtually ZERO. Which is why for literally decades I have been banging the drum in favour of investing in high yield dividend stocks which the financial crisis has given many, many opportunities to accumulate into over the past 3 years. That is one of the primary ways you can protect a significant portion of your wealth against stealth theft of the purchasing power of life time accumulated savings. All that ordinary people can do is to ride on elite's coat tails, such as riding the great stock market inflation of 2009 onwards and what I see but have not had time to write about is the Great Inflation of the housing markets of the UK and USA of 2012 onwards, the analysis of and specific forecasts will come when I have had time convert rough analysis into in-depth analysis articles, but the initial trend signs are there as well as alluding to a new mega-trend that I have been wanting to write about for the past 2 months but not had the time to do so which I will try to make the focus of my next in-depth analysis, to get this analysis in your email in box ensure you remain subscribed to my ALWAYS FREE newsletter. The euro-zone today agreed to flush another Euro 130 billion down the Greek debt crisis black hole which was accompanied by fantasy land statements that Greek public debt would be reduced to 120.5% of GDP by 2020 despite the fact that the economy will continue to contract and total debt will INCREASE. There is NO LOGIC to the statements out the mouths of these euro-cretins. Greece is on a debt trajectory towards 200% of GDP! Off course Greece will default long before that point is reached. The only workable solution for Greece remains as I voiced near 2 years ago, which is for Greece to leave the Eurozone, there has never really been any other alternative. The bailouts are a TOTAL WASTE of TAX PAYERS MONEY! All they achieve is for the politicians and central bankers to buy time whilst ordinary Greeks suffer ever increasing hardship and the rest of europe is made to follow Greece down its debt crisis black hole. 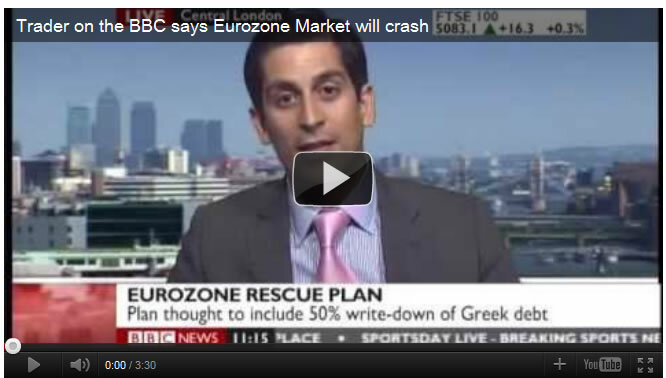 Clearly the euro-zone is designed to benefit the bankster's and mega-rich, NOT the PEOPLE of Europe ! The bigger the market the greater the potential for profit and the less power the masses have as we have witnessed with Greece where the population has NO power, it has all been stripped away from them by the bankster's to currently reside with German bankster's (be they public or private). For the people to have power then their votes need to count, in Greece their votes do not count, no matter who gets elected in Greece they no longer have any power to do anything to help themselves but instead have to follow the dictats of central bankers of other nations. The same holds true for the voters of the creditor nations, such as Germany who are bailing out the bankster's exposed to Greek debt to literally unlimited liabilities because there is no end, no limit to the current crisis because Greece CANNOT PAY BACK ANY OF THE NEW BAILOUT DEBT IT IS ACCRUEING! And the crisis will NOT end with a Greek debt default but spread to virtually EVERY Euro-zone nation. There is only one solution, and for a free market capitalist on face value it is a difficult pill to swallow, which is for the nationalisation of the WHOLE European banking system, lock stock and barrel. It may be lost in the mists of time but this crisis IS a banking crisis, it is the banks who are responsible for this crisis and everything that has since followed, but instead of paying the price they are being bailed out and continue to pay themselves billions in bonuses on fictitious tax payer funded profits. The bankster's have done infinitely more damage to the west then any Al-Qeeda inspired plot could ever have hoped to achieve for they have destroyed the economic prospects of whole nations! The banks caused the crisis not through greed but through out right fraud, they banked billions in bonuses on the basis of fictitious profits that never existed in reality as losses were hidden off balance sheets. For the truth is there is no free market in banking in europe or even the whole world because what exists today is socialism for the rich, where fictitious tax payer profits are privatised and paid out as bonuses whilst huge losses are nationalised and hidden from the general population by a factor of at least X10 than that reported on, which is why I concluded several years ago that the politicians are virtually ALL corrupt and in the back pockets of the bankster elite whom they funnel tax payer monies. This is a mega-inflationary crisis in progress that people who still do not realise what is going on need to sit up and take notice that if they do not act to protect their wealth from the inflationary consequences of what is going on then they will lose everything as inflation will EAT the value of your wealth away like a cancer, and all that money printing bailouts do is to ensure an accelerating inflationary trend. The Dow has achieved the bullish trend scenarios objective. 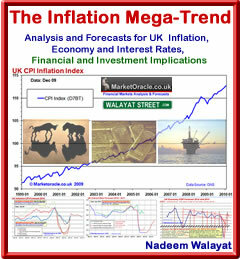 In the interim period I had hoped to have completed a long list of necessary Mega-trends and economic analysis so as to allow a high probability trend forecasts to be generated, unfortunately much of this analysis remains pending, especially that on a detailed trend for the Inflation Mega-trend during 2012. Therefore this is another interim mostly technical take of the Dow. The Inflation Mega-trend - Rampant central bank money printing continues that the fractional reserve banking system ensures will result in a continuation of the accelerating inflation mega-trend that stocks are leveraged towards. Nothing has changed since I first voiced these expectations near 3 years ago (15 Mar 2009 - Stealth Bull Market Follows Stocks Bear Market Bottom at Dow 6,470) that only recently many so called experts have been clocking on to. In fact many of these so called experts at the time were stating that QE would be BEARISH for stocks! Don't believe me, go google the analysts name plus "QE 2009 stock market". The key strategy remains of leveraging ones wealth to the Inflation mega-trend against which stocks is one of the key asset classes, with risk / long term reward favouring investing in consistently dividend increasing stocks that have risen in many cases by over 100% during the past 3 years despite the inflationary depression as illustrated by persistently high unemployment. Fundamentals - The mainstream appears blind to the fact that the rampant money printing is starting to influence official economic statistics that are showing signs of improvement in the United States and Emerging markets at least. This is another example of a trend underway that will only become apparent to most AFTER the event and that trend is that economic recovery currently under way is actually stronger than that which is reflected in current economic statistics which may be revised higher many, many months from now. Do don't let the mainstream press headlines and stories of debt crisis economic doom scare you away from a reality that is significantly better. Market Psychology - Whilst the mainstream press and blogosfear on balance remain decidedly bearish as per continuing euro-crisis and depression, financial collapse headlines, however I have noted that during the past month or so, several prominent commentators have been trying to reinvent themselves as having been bullish all along. Most of the time you want to be on the opposite end of the trade to those that do the rounds on the likes of CNBC approx 75% of the time and perhaps as high as 90% to those that populate the blogosfear. Whilst it is early days, it does tell me that the stock market despite the recent rally is heading for a potentially tough year which is more or less what I concluded towards two months ago in my last analysis and what prompted me to cut my exposure to the stock market by at least 50% which is what I have acted upon during the past month. So market psychology two months on remains decidedly bearish but is tentatively turning bullish, which on balance remains bullish for the stock market but likely to be accompanied by much volatility. Trend Analysis - Long-term - The Dow clearly continues to target the all time high of 14,198, and usually all time highs take some time to be broken which means we can expect a large trading range in the lead upto the a break of 14,200 that could last several years! Additionally the monthly MACD is telling me that the easy money is now behind us with the MACD clearly no longer oversold. So putting both together implies a trading range for the Dow of between 12000 and 14,200 for possibly the next 2 years! The immediate picture is that of consolidation so suggests most of 2012 could see the Dow gravitate around the 13k level, perhaps spend most of the time trading in a range of between Dow 12,500 to 13,500 punctuated by occasional temporary spikes above 14k and plunges below 12k. So the Dow appears as if it will mark time during 2012 by giving plenty of false hopes to both bulls and bears during the year. Trend Analysis - Short-term - The Dow has so far marginally breached bull market resistance at 12,876. Normally when markets break to new highs they need time to consolidate and usually correct back down towards most recent significant resistance which on the above chart is along 12,300, which therefore suggests that would be a target for a correction off of the current trend higher with support along the way offered at the trendline (12,650). Support and Resistance - Significant Resistance is at 13,000, and then 14,000 to 14,200 and support at 12,300 and 12,000. This implies a 2012 Trading range spikes towards Dow 14k and plunges to Dow 12k are likely. Immediate picture is more probably likely to target Dow 12,300, so a correction appears imminent. Elliott Wave Theory - The EW picture continues to play out as of last analysis of 18th Dec 2012 with the current Wave being a Wave 3, that is likely to imminently resolve in a Wave 4 correction that implies it will be followed by an Impulse Wave 5 that could carry the Dow to 14k. This suggests a short-lived correction, to be followed by a trend higher into late April / early May. This also implies that when the 5th wave terminates something far nastier is in store for the stock market which at this point implies an ABC correction back down towards Dow 12k. MACD - Has been diverging from price and has been turning lower which has been flashing an early warning sign for an imminent correction of sorts. This is good in terms of the bigger picture as it is unwinding an overbought state in preparation of the next advance higher. Today - Despite as of writing Europe being lower by about 0.5%. However, Dow 13,000 is so tantalisingly close. I would not be surprised if it is achieved today. The stock market appears to be targeting a trend towards Dow 14k by early May 2012. The immediate trend implies a relatively mild correction is imminent that targets the support trendline of Dow 12,650, which if breached would target a deeper retracement towards Dow 12,300. As things stand the most probable outcome is for a correction towards 12,500. Whilst the big picture is that of a continuing trend higher to Dow 14k at which point the Dow can be expected to experience significant resistance as it approaches a new all time high the subsequent trend for which will become much clearer by that time but which currently implies a significant correction is likely during May which matches both the seasonal tendency (sell in may and go away) as well as likely approaching the finale to the Greek Tragedy (markets act before the event) namely exit from the euro-zone and a deepening Euro-zone recession. This supports the very long-term technical analysis which currently implies it will take some time for the Dow to break and hold to a new all time high. BOTTOM LINE - Short-term correction followed by Uptrend to Dow 14,000 by Late April / Early May 2012. So the crash is always coming crowd will be wrong for a few more months. My strategy - I have already cut my net long exposure to the stock market from about 38% of assets (Dec 18th) to 18% today (as I said I would in December), and will likely continue to cut towards about 12% by late April / Early May as it does look like its going to get a lot tougher for stocks from then onwards, after all we are now in a maturing 3 year bull market. Now watch the bears continue to turn bullish over the next few months as small investors start to pile in just as the market puts in a significant peak. To get my in-depth analysis and detailed trend forecasts in your email in box, ensure you are subscribed to my always free newsletter.